We investigated the use of captchas on mobile devices and multi-touch surfaces. Captchas are challenge-response tests used on the web to distinguish between human users from automated bots. They typically display distorted characters which users must correctly identify and type in order to proceed with a web-based task such as creating an account, making an internet purchase, or posting to a forum. Captchas are often challenging for users to complete on regular desktop computer, but they are especially frustrating for mobile users accessing websites from touchscreen smart phones. The small screen makes it difficult to distinguish the distorted characters so users must zoom and pan, the virtual keyboard obstructs the challenge, and auto-correct modifies the typed characters. Mobile surfaces such as smart phones and tablets have become a primary means of accessing online resources for many users, but existing captchas hinder usability and lead users to abandon tasks. We are working towards finding an alternative captcha that addresses the usability issues while maintaining security. This has potential uses for any mobile website concerned with spam and bots. Mobile surfaces are equipped with touch screens allowing a rich set of multi-finger interactions that offer new possibilities for input interactions for captcha schemes. We are exploring captchas adapted specifically to utilize gestures and other touch screen interaction to offer an improved alternative to existing captchas. Our work on touch screen captchas would also be beneficial for use with larger touch surfaces such as those found with new laptops. We developed and validated a set of heuristics for the evaluation of captchas on mobile devices. We have also designed and evaluated several mobile-friendly captcha prototypes where existing captcha schems were modified to have input and output more suited for mobile devices. 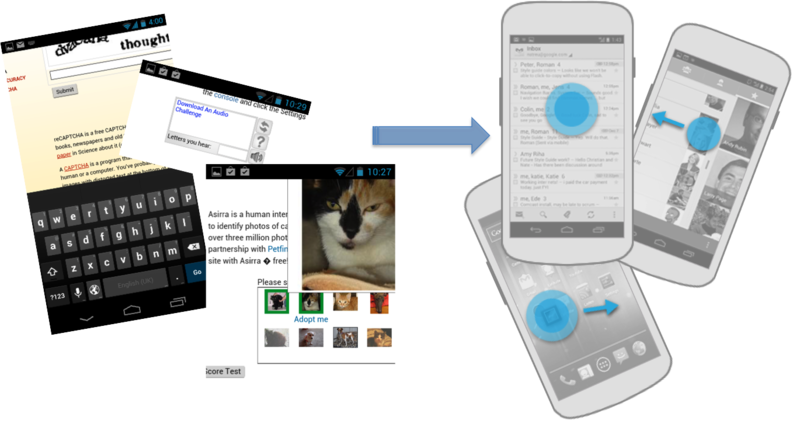 We have conducted user studies of several existing captchas on mobile devices. Gerardo Reynaga, Sonia Chiasson, and Paul C. van Oorschot. Exploring the Usability of CAPTCHAS on Smartphones: Comparisons and Recommendations. In NDSS Workshop on Usable Security (USEC). Internet Society, 2015. Gerardo Reynaga, Sonia Chiasson, and Paul C. van Oorschot. Heuristics for the Evaluation of Captchas on Smartphones. In British HCI Conference. ACM, 2015.